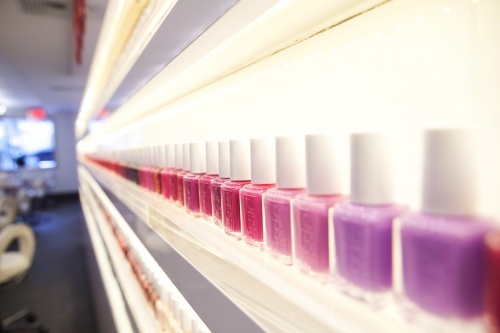 Essie’s Flagship Salon – NYC | Ooh, my favorite! As much as I love my nails when they’re painted I always get in trouble for wearing them into “inappropriate” states (Mari’s exact phrasing), and even as I type now I’m looking at my sad, faded, chipped nails. In my defense though, I don’t like the smell of nail polish remover. So there. But for all of you proper mani-pedi lovers out there (and boy there are a lot of you) I figured you’d be interested to know that Essie is opening a flagship salon in NYC this week. Those plush leather chairs you see are dyed to match their most popular polishes, and the wall of colors has just about 300 different shades. (I never knew they were bought-out by L’Oreal…did you?) It’s located inside the Samuel Shriqui Salon (explains the lack of windows perhpas). Manicures start at $32, and pedicures start at $65. Would be a nice special occasion gift for you or your favorite chick.